Do You Know What Your Aerobic Maintenance Provider Can Do for You? 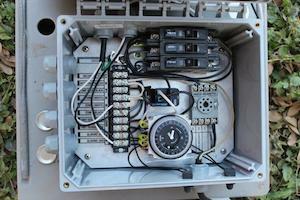 All aerobic systems require maintenance, and are required by TCEQ to be checked every 4 months. Simple enough, right? Not exactly. Most homeowners think the only thing to check is the chlorine, but this is just one of the minor things checked during routine maintenance. Here’s just a few of the things a licensed septic maintenance provider can do for you. Some counties in Texas allow homeowners to service their aerobic septic systems. This may seem cheaper, but it’s almost always a bad idea. If you are doing your own maintenance and not checking everything correctly, you could cause damage to parts, or cause more expense in the long run due to system neglect. Let’s assume that you are checking the system correctly. You’re not spending any less to replace parts than your provider, and they often have the parts on hand. Otherwise you spend your time trying to track down the correct parts, paying for shipping, and waiting for those parts to be delivered. And if it takes too long there may be a negative domino effect on your system, which means having to hire a professional anyway. When you factor in your time (along with TCEQ reporting requirements, recommended training, and immunizations you would need to get to avoid getting sick), the cost of a maintenance contract seems minimal. A maintenance provider keep records for warranties and the systems maintenance history so you don’t have to. He or she will also take care of forwarding copies of service reports to the county within 14 days of a servicing. One less thing for the homeowner to worry about. Why should you have to keep track of the status and functionality of all these pieces? A maintenance provider can do so for you. Aerobic systems are complex, and require training and expertise to service and keep functioning safely. Aerobic Maintenance Providers and Technicians are licensed by the TCEQ — this requires training and passing an exam. Electrical knowledge and experience is required since most of the systems operating components are electrical. These components are tied into circuit boards in control boxes which power the system. And as you might have guessed, aerobic systems are full of lots of germs. Immunizations for being in contact with wastewater are highly recommended for anyone doing maintenance on an aerobic system. Oftentimes routine maintenance for several parts requires reaching into the tanks. If you need help maintaining your Clearstream aerobic system, we’d love to talk. Give us a call at 830.249.4000 (Boerne) or 210.698.2000 (San Antonio) or contact us online to schedule a septic check-up. I would like to know what you charge to come and inspect my unit. I live in Kerrville out on hwy. 16 south. My phone number is 432-559-9224 . my e-mail is above. I need your price to check my system. Thank you for contacting us. We will call you this morning. Talk to you soon!